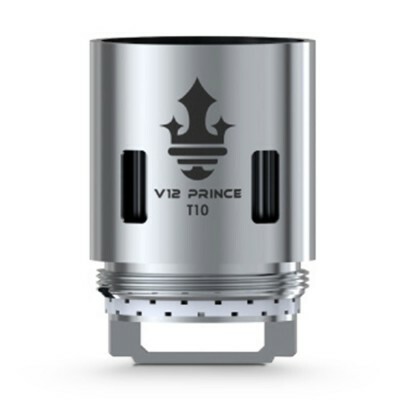 With the Prince TVF12 Smok have produced a vape tank which produces excellent cloud performance and intense flavour. New with this tank is a lock on the top which both ensures the tank is child proof and reduces the chance of leakages. 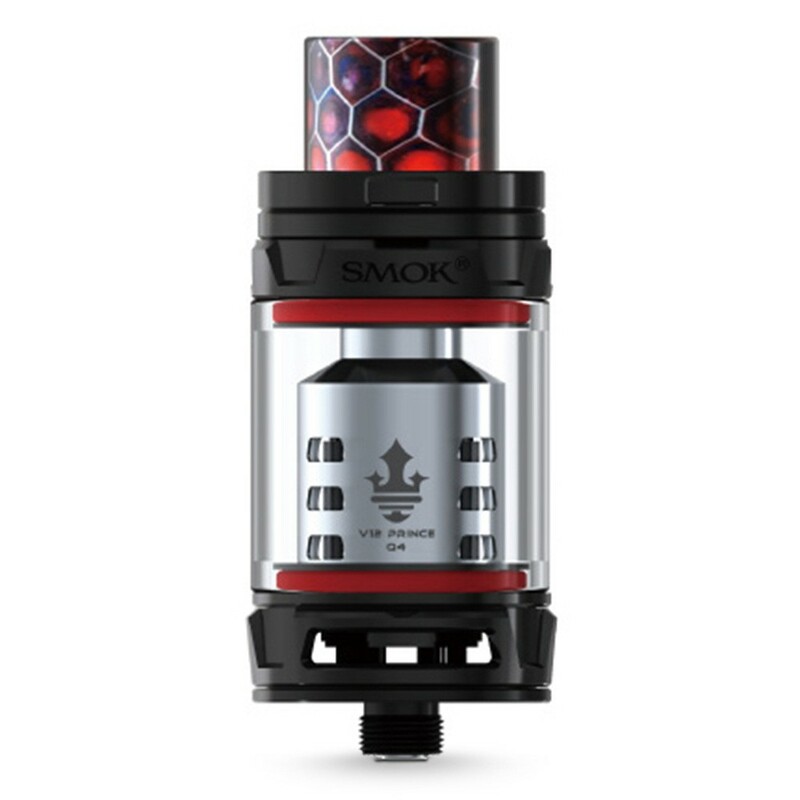 The drip tip is wide open and perfect for cloud vaping, matching well with the wide airflow controls, and dispenses with the usual dull black for a dappled cobra skin pattern. With its eye catching design and solid size the TVF12, paired with a larger mod the tank will make a solid impression. One new feature on the Prince TVF12 tank is a tank lock. Simply press this in and you are able to swing the top of the tank open to reveal the filling port. In addition to the easy filling that we are coming to expect from modern tanks, the lock also ensures that children can access the tank and prevents accidental leakages from the tank coming undone in your pocket. There’s plenty of room for manoeuvre with the airflow controls - open wide for a large airy vape or reduce for a tighter warmer vape full of flavour. You’ll also notice 12 airholes on the lower resistance coils which are ideal for high wattage vaping. 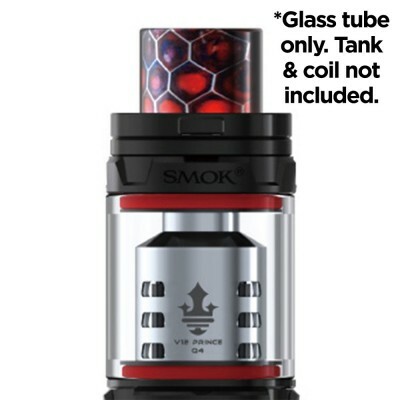 Please note that the Smok Prince TVF12 Prince is compatible with Prince coils, but not all other Smok TVF12 coils (although it is does work with the Q4 and T10). Fortunately, the Prince tank comes with three great coils included, which gives you plenty of vaping time and the chance to experiment and find which coil suits you better. Now, into the provided coils, all of which are made with stainless steel. At 0.4 ohms, the pre-installed quadruple Prince-Q4 is the highest resistance coil, but still produces plenty of vapour. Coming with 4 strands of wire in the coil, the Q4 is best used in the 60 to 80 watt range. 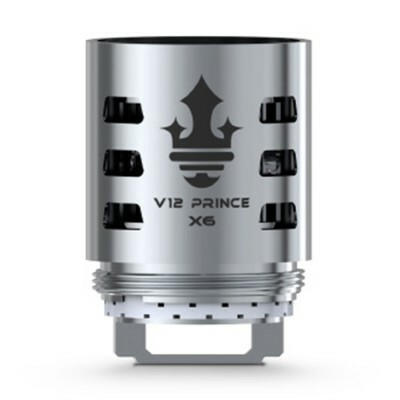 The V12 Prince-X6 is a Sextuple coil, consisting of two coils holes, each with three wires. At its limits this can be used between 50 and 120 watts, but Smok advise an optimal range of 80-100 watts. The coil comes with 12 air holes. Finally the V12 Prince-T10 Decuple coil head comes with the lower resistance of the three, weighing in at 0.12 ohm. This coil comes with five coil heads, each with a single wire in them, and 6 large air holes to maximise airflow. The Smok Prince is also compatible with the Smok Strip coil. As with all coils, but especially sub ohm devices like the Smok Prince coils, ensure you prime the coil before using. To do so simply drip a little e-liquid into the coil holes, and allow to soak for a few minutes. First, always ensure the tank is filled before e-liquid runs out, as this protects the coils from a dry burn. Press the button at the top of the tank to disengage the lock. Slide the top open. The filling hole is on the outer rim. Insert your e-liquid nozzle into the hole and squeeze until full. (Do not fill via the center hole. Slide the top back and push until you hear a click. For more details, check out the video guide to filling tanks below.